I was thinking about a phrase the other day, one that was drilled into my head when I was about eight or nine, right around the time I was learning simple multiplication tables. Two times two equals four. It doesn't matter how many times you write it or repeat it, the equation will always be true, the result is always four. What I have learned in my experiences working with children is how you say it matters, how you say it out loud changes the results. Even though I am referring to a math equation, it's just a metaphor. I'm not really writing about math, I'm really referring to tone, the tone we use with our children. What are their facial expressions telling me? What is their body language telling me? What kind of tone are they using in response to mine? 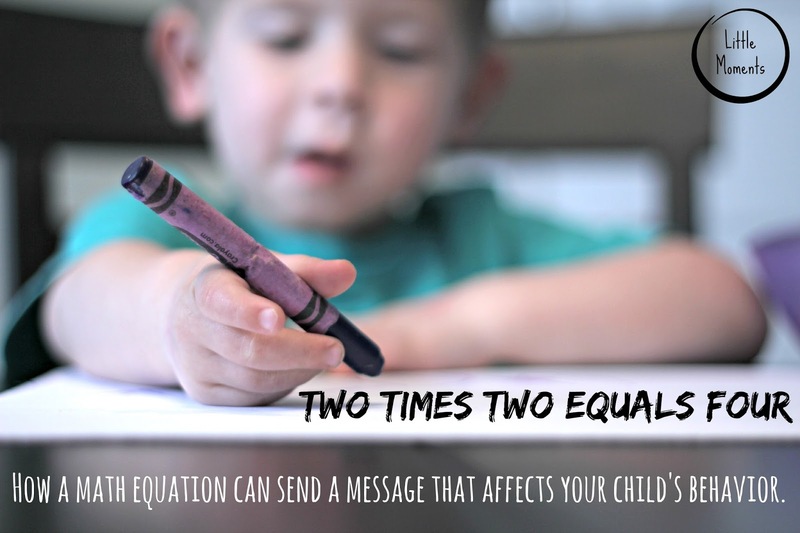 Two times two equals four is something I picture in my mind when I'm reflecting on how I react to my children when I'm upset, because my tone reveals a lot more than "four" as an answer. Write down a list of emotions that come to mind on a piece of paper. Try for at least five. Repeat the phrase two times two equals four for your partner using one of the emotions you wrote down. Do not say anything else. Use only that phrase to try and express your emotion. Body language can be used as well. Have your partner guess what emotion you are trying to convey. Continue to repeat the phrase for each emotion you wrote down until each one has been guessed. Discuss and think about how your tone would be received by a child, even though you are saying the same thing over and over. There have been times when I've gotten frustrated to the point where my tone has emitted anger when my children are not listening to what I've asked them to do, and they continue to not listen, or react in anger themselves. Sometimes I take a moment to step back and change my tone, and sometimes my husband has stepped in, repeating what I've already said, in a different tone, and their responses change. Conveying a certain tone can make a child feel and do things in a pleasant, or an unpleasant way. As an adult, I perceive an array of emotions coming from other adults and children that make me feel and react in a variety of ways myself. It depends on the message they may be trying to send. What message do you want them to hear in your tone? Pay attention to how you sound when talking to your children, it can speak volumes to them.